Fried potatoes is one of the most affordable and many of your favorite dishes having pleasant taste and enormous energy value. Roasting potatoes with a large amount of vegetable oil makes this dish high-calorie almost 2 times. To reduce the energy value can be, if you fry potatoes in lard, fish oil, or normal water. Roasted potatoes involves high amounts of fat and equal the caloric content of the sandwich with butter. The calorie average is around 203 calories in 100 g French fries — 312 kcal). This dish is not recommended to take in food for people with digestive problems, excess weight and metabolic process. Oil, which is fried potatoes, is deposited in the human body in the form of fat. If you want to have a nice body, then discard French fries, fried potatoes using oil. For weight loss include in your daily diet is not more than 200 g potatoes. 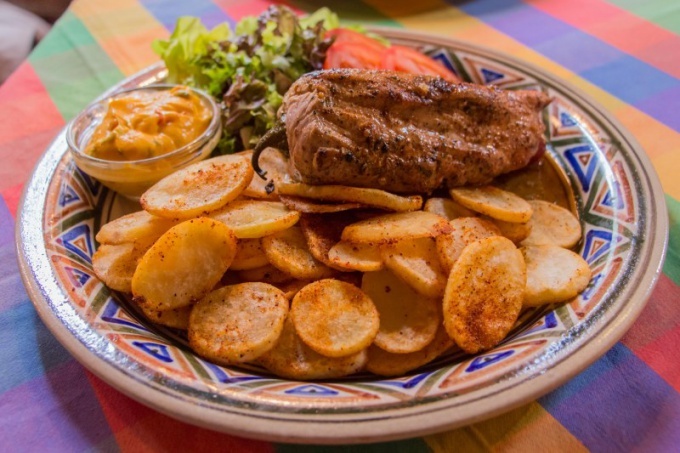 It is best to eat this dish at lunch, since the potatoes for dinner will lead to body fat. In order not to gain weight, it is recommended to fry the potatoes in normal water or fat. Wash the potatoes, remove the skin and "eyes", then rinse again. Cut each potato in half and then into strips. Clean onions, cut into small cubes. Peel and wash the carrot, grate it on grater medium size. Cut potatoes put in a pan, pour some water (about 3 tbsp), salt and pepper to taste, fry on a small heat for about 5-7 minutes. From time to time, stir the potatoes. Add chopped onion and grated carrot, then mix thoroughly and cook for about 5 minutes until Golden brown. Then turn off the heat, cover the pan with a lid and leave the potatoes to steep for 5-7 minutes. Put the fried potatoes on plates and serve with meat, fish or sausage. Peel and wash the potatoes, cut it in half and then into small slices. Heat the pan, then place on it the slices of bacon on medium heat witopia fat. The resulting grease can be removed. Put into the pan the potatoes and fry in fat to a state of readiness. In the end it should break the eggs right to the potatoes, season with salt and pepper, then cover the pan and some more time to hold on small fire. Before serving sprinkle the potatoes finely chopped herbs (parsley, dill, etc.). Bon appetit!